Shitennoji Temple is located near Osaka Bay. The location of the sacred building is very well thought out and implemented and since then the temple played an important role in cultural and commercial development of Osaka - the third largest by population city in Japan. Despite numerous renovations and upgrades, the castle was able to retain its authentic form. Shitennoji Temple is a symbol of the Japanese city of Osaka. The sacred space has over 14 centuries of history. In fact, its construction is going along with the establishment of Osaka city as a cultural, commercial and religious center of Asian countries at the end of the VI and VII centuries. The temple was built by Prince Shotoku, son of Emperor Yomei. The castle was built as a symbol of gratitude to the prince's Four Devas, for which local beliefs say were patrons of Buddhism and Buddhists. It is these mythical beings that help to beat the then ruler Mononobe-no-Moriya - a strong opponent of Buddhism. So, thanks to their prayers, the sixteen-year-old Prince Shotoku managed to have the new faith take hold in Japan. The building impresses with its imposing appearance and buildings. Shitennoji Temple consists of the body of a tall tower, prayer hall and an auditorium for teaching. It is the personification of typical Asian architecture. 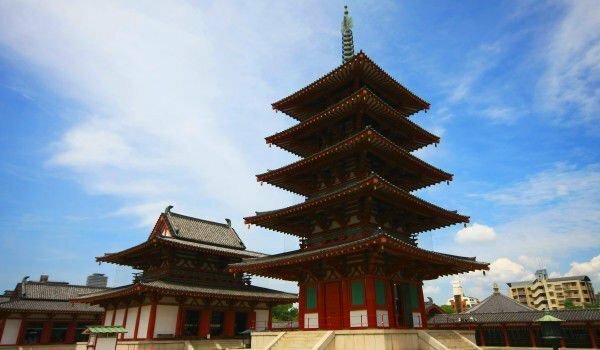 The sacred place has many similarities with the Horyu-ji Temple in the Japanese city of Nara, declared a World Heritage Site. Soon after its construction, the religious temple began to perform the functions for which it was created, namely to help with food, medicine and shelter to people in need. Perhaps the most interesting time to visit the temple is in the autumn. Then guests can enjoy the festival Shiten'no-ji Wasso. The event recreates the history of the Korean Peninsula and Japan through cultural exchanges and various arts. Local residents say the temple has a huge permanent visitor interest. Shitennoji Temple is each year teeming with tourists, which not only become acquainted with the traditions of Buddhism, but if they wish to buy interesting souvenirs at affordable prices, they can do so here. On the 21st day of each month is held a trade fest around the building, where visitors can buy many things that symbolize Japanese culture - authentic swords, kimonos, dolls, ceramics and much more. Negotiating Prices of items is also part of the spirit of the trade fair, held each month around Shitennoji Temple. Shitennoji Temple is perceived by many Japanese as the most important Buddhist temple - altar of Osaka. This religious temple is open daily from 8:30 to 16:30, from April to September. Accordingly, from October to March, the temple welcomes visitors from 08:30 to 16:00. Access fee is 300 yen, and for students it is reduced to 200.